Following in the footsteps of St. Alphonsus Liguori and 17 other confreres who have been canonized or beatified, approximately 5,300 Redemptorists serve in 78 countries throughout the world. Our brothers and priests bring a message of hope and Good News to everyone they encounter: “In Him there is plentiful redemption” (Psalm 130:7). Looking for a Redemptorist parish or retreat house? Here’s a complete list of our locations. St. Alphonsus Liguori was born in Naples, Italy, in 1696. He left a promising legal career against the wishes of his family and became a priest. Alphonsus dedicated himself completely to the service of the poor and most abandoned, and in 1732 he founded the Congregation of the Most Holy Redeemer: The Redemptorists. Alphonsus and his companions preached the Word of God in rural and isolated communities around Naples. He died in 1787 at age 90 and was declared a saint in 1839. His feast day is August 1. By the early 19th century Redemptorists were serving in central Italy, Poland, Germany, Belgium, and Holland. In 1832 six Redemptorists traveled to the United States at the request of American bishops and began their first missionary work outside of Europe. They worked first among Native Americans and then with Irish, German, and Slavic immigrants. They ministered to the people and opened parishes and schools, often teaching immigrants the English language. In 1847 St. John Neumann, born in Bohemia and the first Redemptorist to profess vows in the United States, was appointed superior of all Redemptorists in America. Five years later he was consecrated the fourth bishop of Philadelphia. He died in 1860 and in 1977 became the first American bishop to be canonized. His feast day is January 5. In 1850 the Redemptorists’ American Province, consisting of nine houses, was established from the Belgian Province and headquartered at the Redemptorist seminary in Baltimore. Redemptorist ministries soon spread throughout the United States and Canada. Missions were established in Puerto Rico, the Dominican Republic, the Virgin Islands, Brazil, and Paraguay. The Redemptorists have a special devotion to the crib of Bethlehem, the cross of Calvary, the Eucharist, and Our Lady of Perpetual Help. Learn more about the devotion to Our Lady and the Redemptorist’ special mandate to “make her known throughout the world” under the title Our Mother (or Our Lady) of Perpetual Help. In the United States the Redemptorists are divided into two provinces (Baltimore and Denver) and two vice provinces (Richmond and Vietnam). A province is financially self-sufficient and staffed with sufficient priests and brothers to do the work entrusted to it. A vice province is dependent on outside sources for support. The Vietnam Vice Province was created to work with Catholic Vietnamese and Japanese who fled to the United States after the fall of Saigon in 1975. The Baltimore Province in the northeastern Unites States is the oldest province in North America and has the greatest number of priests and brothers. Despite its name, our headquarters are in Brooklyn, New York. Attached to it are the Vice Province of Richmond (established in 1942) and the Caribbean Region (established in 1999), including the islands of St. Croix, St. Lucia, and Dominica. In the center is the cross of our Redeemer’s passion, the instrument of our salvation. Resting against the cross are the reed and sponge as well as the lance that pierced our Lord’s side. Flanking the cross are the letters, superimposed on each other, I and S for the name of Jesus, and A and M for “Ave Maria. The cross itself stands on the hill of Calvary. Above the cross is an eye, symbolizing the all-seeing eye of God. It is also the image of a right eye, symbolizing God’s providential care. Above the eye is a crown, symbolizing St. Alphonsus’ belief that all who persevere in the Congregation will receive a crown of glory; it also symbolizes the “crown of life” mentioned by St. Paul. Enclosing the seal are two branches: the olive branch of peace and the palm branch of martyrdom. 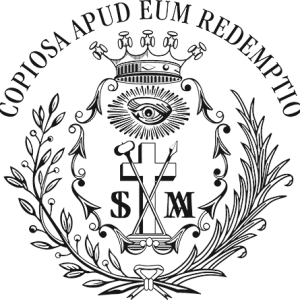 Over all is the motto of the Congregation: Copiosa apud eum redemptio (With Him there is plentiful redemption).